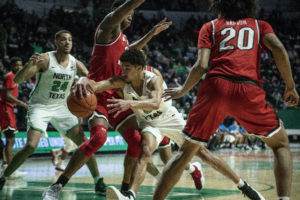 The North Texas men’s basketball team (20-5, 8-4 Conference USA) lost its late comeback attempt against the Western Kentucky Hilltoppers (15-10, 8-4 C-USA) in the alumni game Saturday, 62-59. Junior guard Ryan Woolridge and redshirt freshman Umoja Gibson led the Mean Green in scoring with 18 a piece. Woolridge added in six rebounds and six assists to his stat line. North Texas was limited to 15 points in the first half on 7-of-34 from the field and 1-of-15 from behind the arc. The Hilltoppers shot 46 percent from the field on their 30 points. Mean Green junior guard Ryan Woolridge attempts to pass the ball around a Hilltopper defender to sophomore forward Zachary Simmons at the game against Western Kentucky on Saturday, Feb. 9, 2019 at the Super Pit. Image by: Trevon McWilliams. 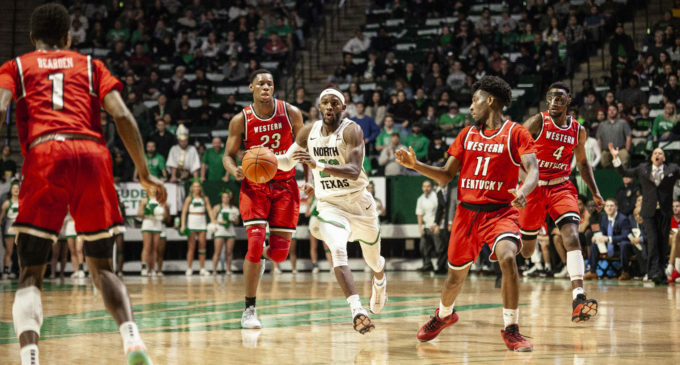 The Mean Green picked up their scoring and defense in the second half, shooting 48.5 percent from the floor while limiting the Hilltoppers to 39 percent. 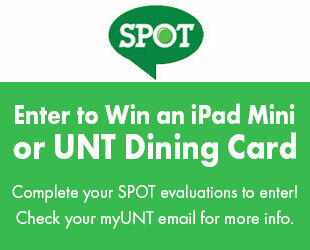 The Mean Green out-scored the Hilltoppers 44-32 in the second period. North Texas second-half defense paid off, giving them 19 fast break points compared to them being limited to two in the first half. The rebound and turnover battle were similar, both teams had a total of 38 rebounds and the Mean Green had four less turnover in the game. Mike Miller had 14 points to go along with 11 rebounds giving himself a double-double. There were 8,195 in attendance on Saturday for the annual alumni game, the fourth highest in program history. UP NEXT: The Mean Green will play Florida Atlantic (14-11, 5-7 C-USA) at 6 p.m. on Feb. 14 in Boca Raton. Featured Image: Mean Green senior forward Michael Miller lead the fastbreak through several Hilltopper defenders at the game against Western Kentucky on Saturday, Feb. 9, 2019 at the Super Pit. Image by: Trevon McWilliams.